Yesterday I showed you this view into our living room from the front of our home. Today I thought I would share the rest of our living room all decked out for Christmas. This is the view from our breakfast room. Even our tv armoire gets into the holiday spirit. I added the ribbons to the doors last year and hang some of my favorite Christmas cards on there when they come in. I love our angel! I purchased her at HobLob at half off last year. The candles on either side are really neat. They flicker like real candles and actually glow a real candle light and not orange like most. Simple table coffee table decor. The current home of our Lego Advent calendar prizes! Partial view of our fireplace. 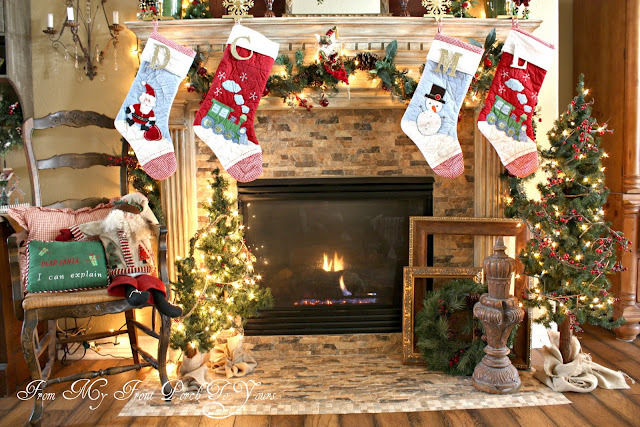 If ya wanna see more head on over to my Holiday Mantel Party! Lots more pics there! This is the small area off to the left of our fireplace. Last year it held our manger but this year it holds another one of my most coveted holiday decorations! I just love this vintage porcelain tree! I purchased it off the local yard sale site a few years back for cheap. It even plays music!! I decided this would make a great spot for the cardboard vintage like houses I purchased at HomeGoods a few months ago. I just adore those as well. They light up which the boys love. I was irritated though because the one did not work after putting batteries in it but no worries. I ended up taking the light box out of the bottom and just stuck a small faux tea light under there and it works just fine. The boys love Nutcrackers so I try to add a few every year. If ya wanna see what this area looked like last year click here. Your holiday decor is all so pretty, Pamela. Your house looks so warm and cozy, just the way a home should look at Christmas time. Your Christmas decorations are so beautiful! You've given me a lot of wonderful ideas to use next year when I decorate. Thanks for sharing! Pamela it all looks so cozy and festive...very nice! 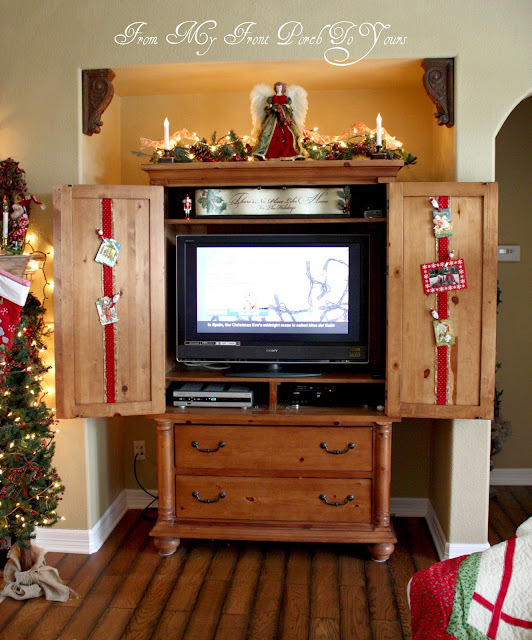 I like your idea for the ribbon and Christmas cards on the backs of your armoire doors. You have so many cute little decorations! My son loves Nutcrackers as well. By the way I love your wooden floors...so nice! 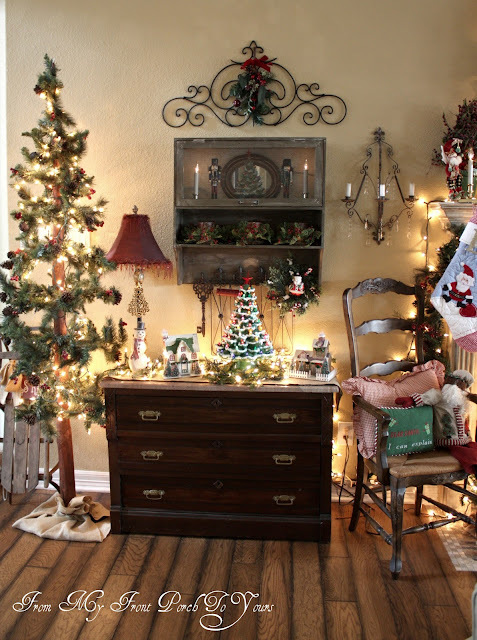 Your home is so beautifully decked out for the Christmas season! I had to laugh at your "vintage" porcelain tree, Pamela! I remember when those were quite popular when I was growing up. But then, again, I guess I have hit the vintage age myself! : ) Love your tray ~ you know that harlequin paper speaks to me. I love how you used it in the frame. I save Christmas cards with cute card designs, so this would be a great idea for them. Pamela, everything looks so warm and festive!! 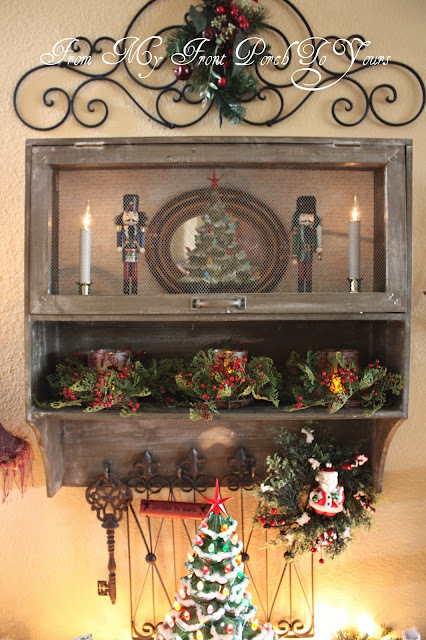 Love all the pretty vignettes! It is truly a Christmas Wonderland! Your home is beautiful, I love all of your lovely decor. You are a really good decorator. Your living room is gorgeous Pam! So festive and cozy and I bet at night it is so pretty all lit up. Hi Pamela, wow! Your home is warm and inviting while beautifully stylish. Thanks for mentioning us! We love nutcrackers too and have them on the mantles! So pretty!! !